Shihan Miyuki Miura was born in 1949 in Chiba, Japan, the son of a ship's engineer. At age 13, Shihan Miura began the study of Shotokan karate, receiving the rank of nidan by his 18th birthday. Shihan Miura also studied judo during this time, achieving the rank of shodan by age 17. From the age of 18, Shihan Miura worked out at the Headquarters of the Kyokushinkai Honbu in Tokyo under Mas Oyama. Upon graduation from college, Shihan Miura became an uchi deshi at the Honbu; eating, sleeping, studying, and teaching at the dojo for over two years. At the time, Miura's senior was Saiko Shihan Yasuhiko Oyama. In 1971, Shihan Miura, at 5 foot 10 inches (1.78m), 160 lbs (73 kg), placed 4th in the Japanese National Championship, and he took first place in the All-Japan Tameshiwari competition. In 1972, Shihan Miura won the 1972 All-Japan Full Contact Karate Tournament. To win this championship, Miura defeated both Howard Collins and Toshikazu Sato. Soon after his Championship, Sosai Oyama approached Miura to participate in the 100-man kumite. Miura accepted, and on April 13, 1972, Shihan Miura successfully completed the 100-man kumite in a little over 3 hours. After a short recovery time, Miura, at age 24, was sent to New York to acculturate to the United States and study under Soshu Shigeru Oyama, and then he was sent to Chicago, Illinois, to run the Chicago Kyokushinkai dojo. Shihan Miura has taught at a dojo in the Chicago area since that time. 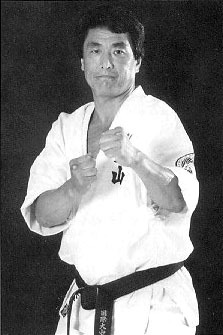 In 1984, Shihan Miura began teaching karate under the auspices of the World Oyama Karate Organization, an organization founded by Soshu Shigeru Oyama. Shihan Miura taught at the Midwest Headquarters of the World Oyama Karate Organization. The school was fairly sizeable, and regular students as well as Japanese uchi deshi (who make a commitment to train and work and live at the dojo for five years) train together on a regular basis. In 2002, Shihan Miura decided to part company with Shigeru Oyama, and now no longer trains under the World Oyama Karate organisation. Instead, he operates simply as Miura dojo.